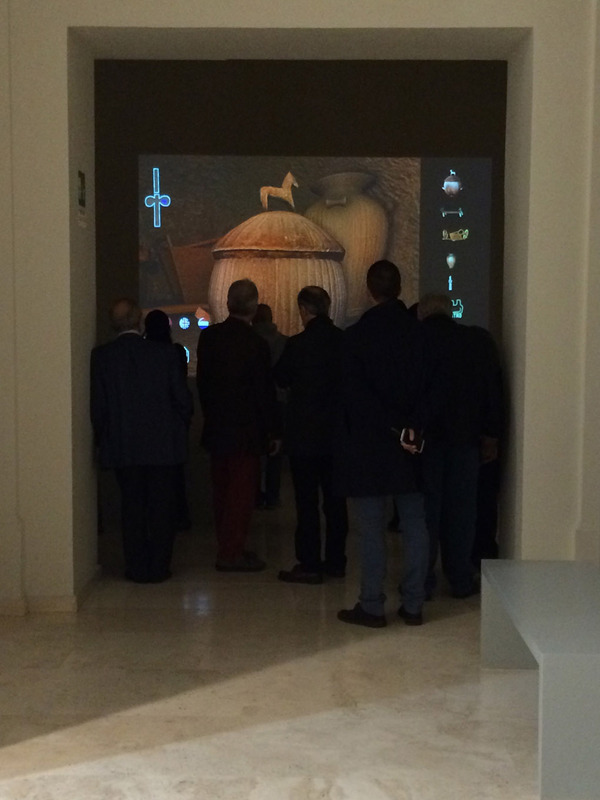 On April 4, 2013, the latest version of the Etruscanning 3D application was inaugurated in the Museo Gregoriano Etrusco in the Vatican Museums. 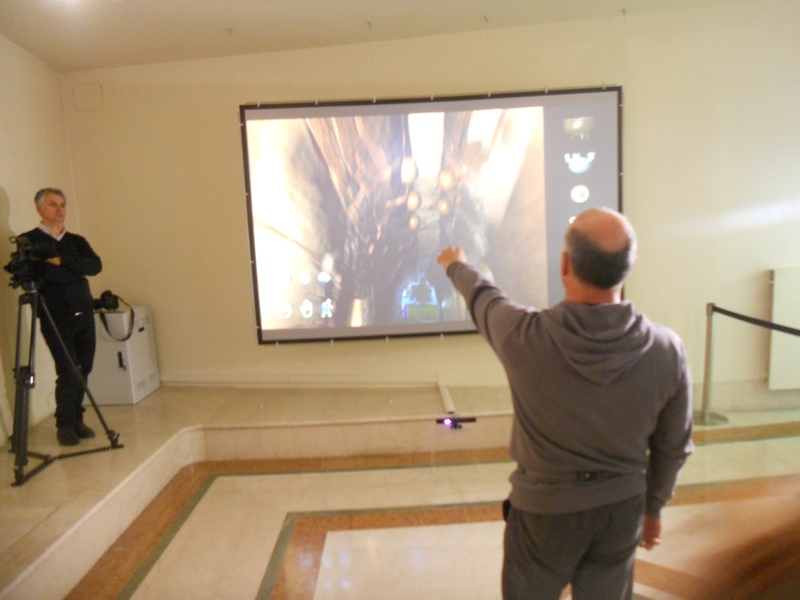 The installation consists of a non-interactive film that is displayed in Room 2 where the Regolini-Galasssi objects are displayed, and an interactive 3D application with a natural interaction interface in Room 16. 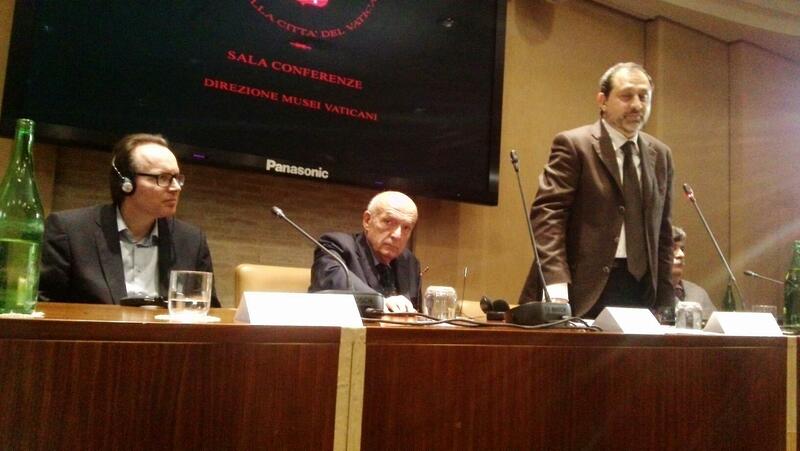 On multiple screens within the Vatican Museums, an introduction film to the application was shown. 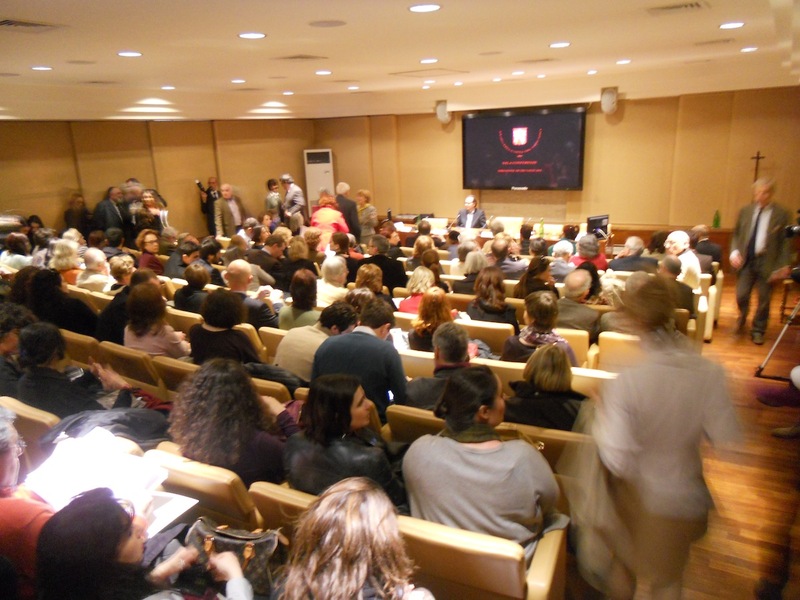 The inauguration of the installation was proceeded by presentations by the involved project partners, introduced by Antonio Paolucci, director of the Vatican Museums. Maurizio Sannibale, curator of the Gregorian Etruscan Museum, provided an introduction to the Regolini-Galassi tomb, and Wim Hupperetz, director of the Allard Pierson Museum and Etruscanning project coordinator, presented the project and the resulting publication. 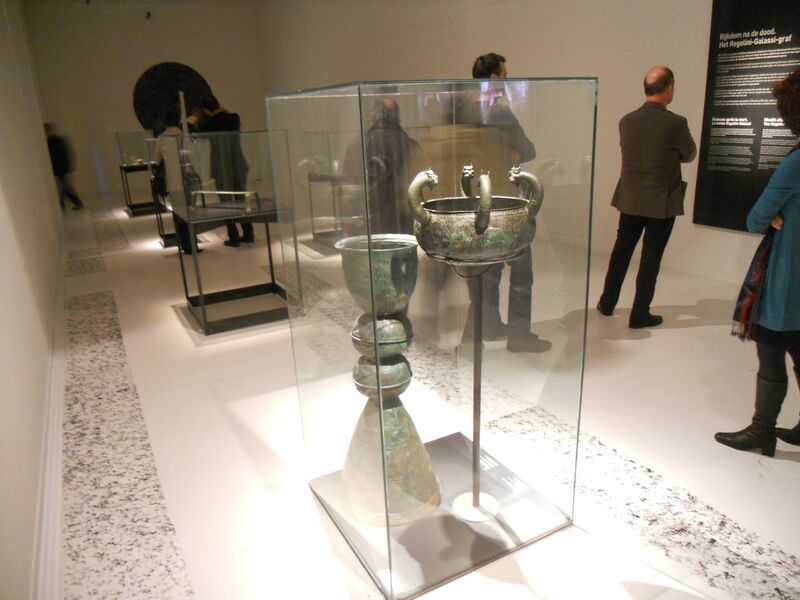 Salvatore Garraffo, director of CNR-ITABC, introduced the technology used in the project, while Eva Pietroni (CNR-ITABC) and Daniel Pletinckx (Visual Dimension bvba) explained the natural interaction interface, the digitisation of the museum objects and their digital restoration. Rita Cosentino (Soprintendenza all’Etruria Meridionale) and Vincenzo Bellelli (CNR-ISMA) provided a wider context for the Regolini-Galassi tomb and its objects. 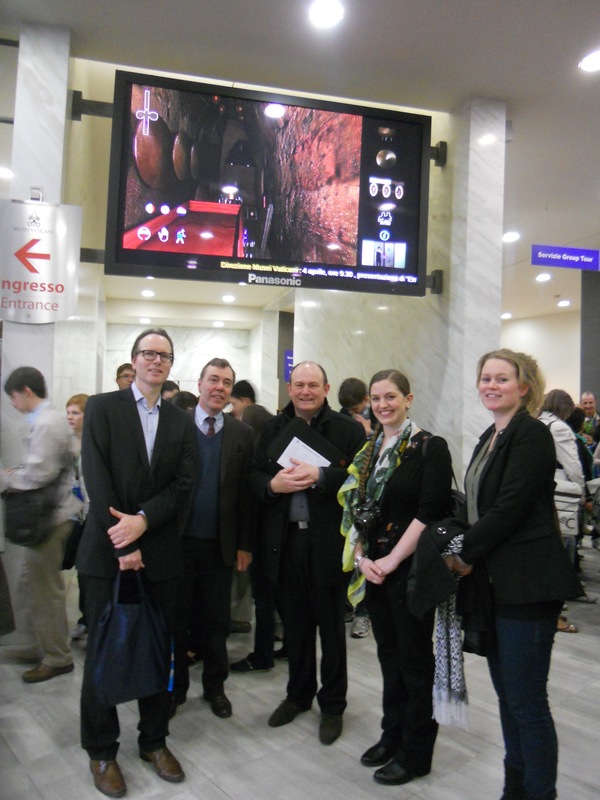 After the presentations, the installation was inaugurated. 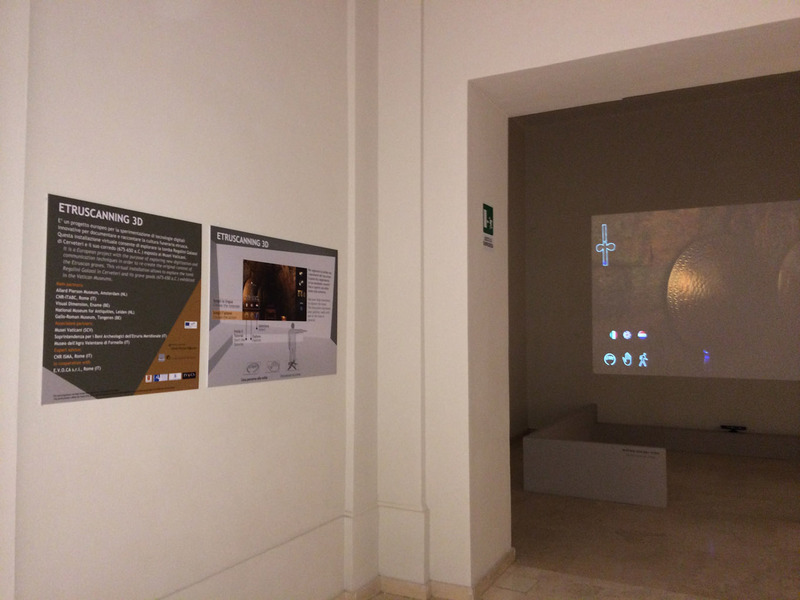 In Room 2, where all objects of the Regolini-Galassi tomb are on display, a large screen shows the virtual reconstruction of the tomb with the digitally restored objects integrated in the tomb. 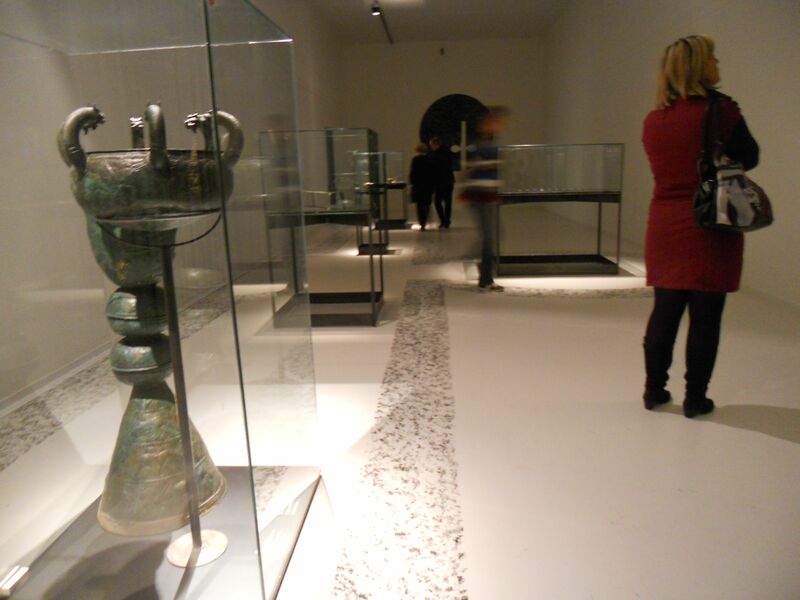 In this way, the objects are shown in their original context in their original state, providing the visitors with an even better appreciation and understanding of the objects. 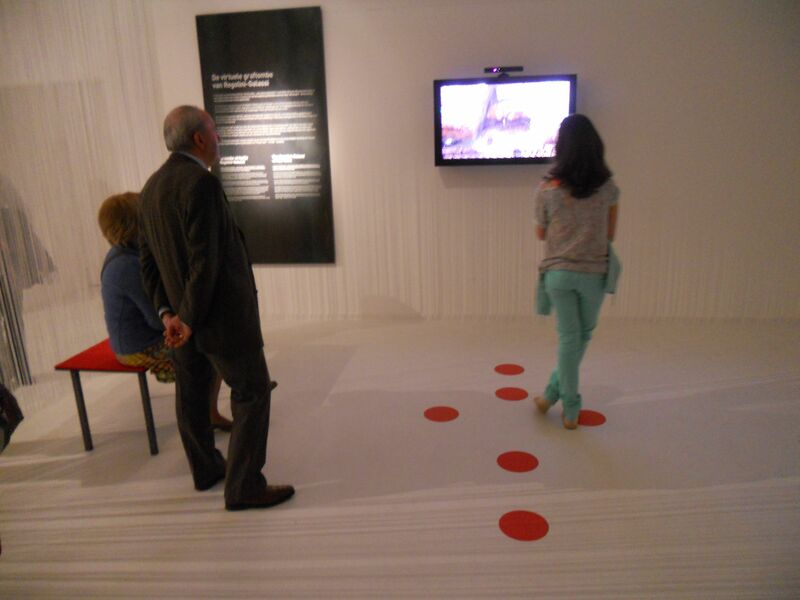 The film invites the visitors also to use the interactive application, which is located in nearby room (room 16), due to the lack of sufficient space in the Regolini-Galassi room. 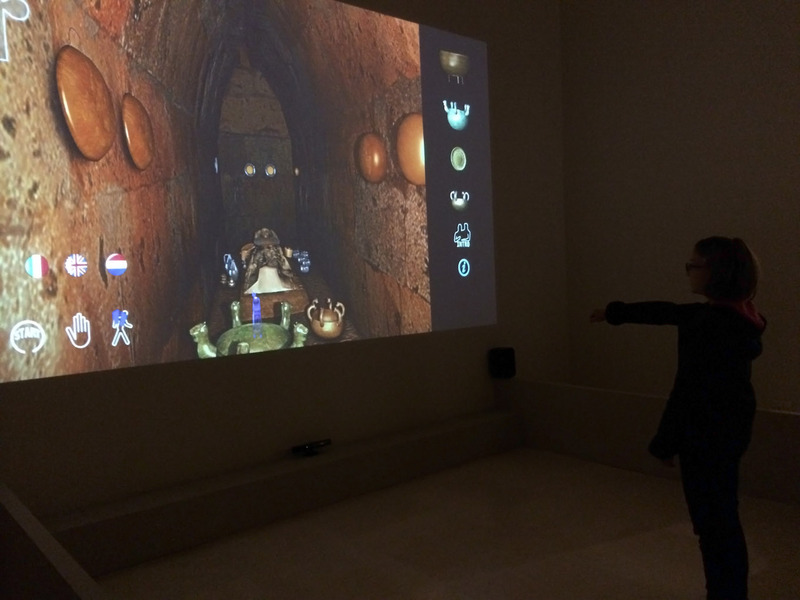 In the interactive application, the visitor navigates through the tomb and selects objects and their related stories through simple, natural gestures (such as right arm forward for moving forward) detected by a Kinect camera. 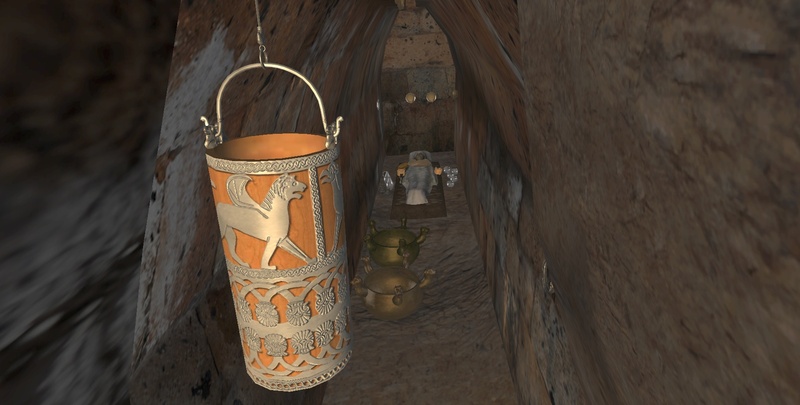 When starting, the visitor can select a language (Italian, English, Dutch) and can practice the navigation and object selection when approaching the virtual tomb. Once inside, the visitor can explore the entrance, antechamber, cella, left and right niche of the tomb with all its objects in place, select specific objects and listen to the stories connected to the objects. This video shows how it works in English or Italian. 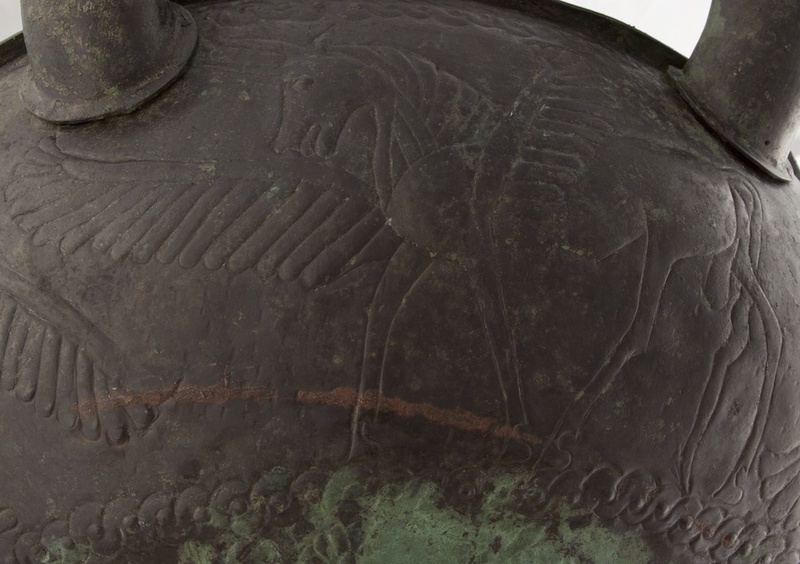 While doing the digital restoration of several objects of the Regolini-Galasssi tomb, we noticed that there are many depictions of griffins on these objects. Griffins were a popular theme in Etruscan art in the Orientalising Period in which this tomb has been built, but they are depicted in a very distinct, consistent way, with two long curls in the neck, which proves that there is an interesting story behind. 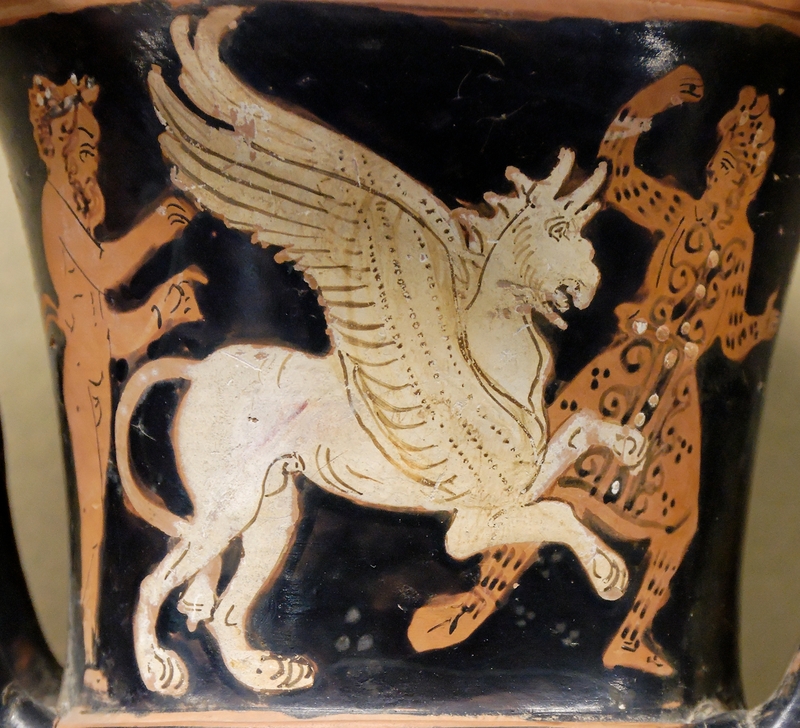 What are the origins of griffins, why are they depicted in this peculiar way? 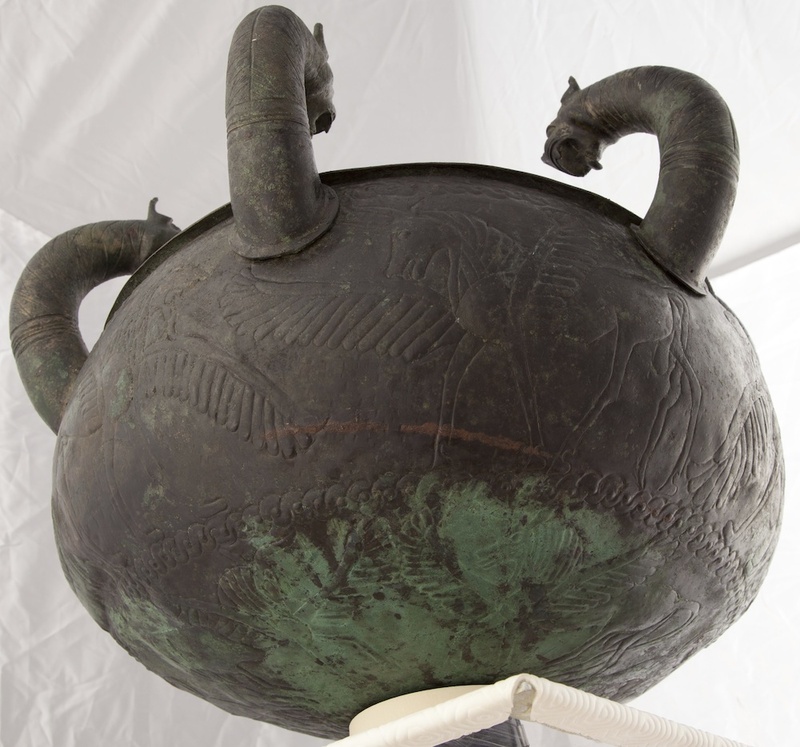 For example, a griffin is depicted on the situla which we have restored digitally (see image below). As we can see from the image above, the griffin has the body of a lion but has wings and a beak like an eagle, very specific ears and two strange curls at the back of the head. 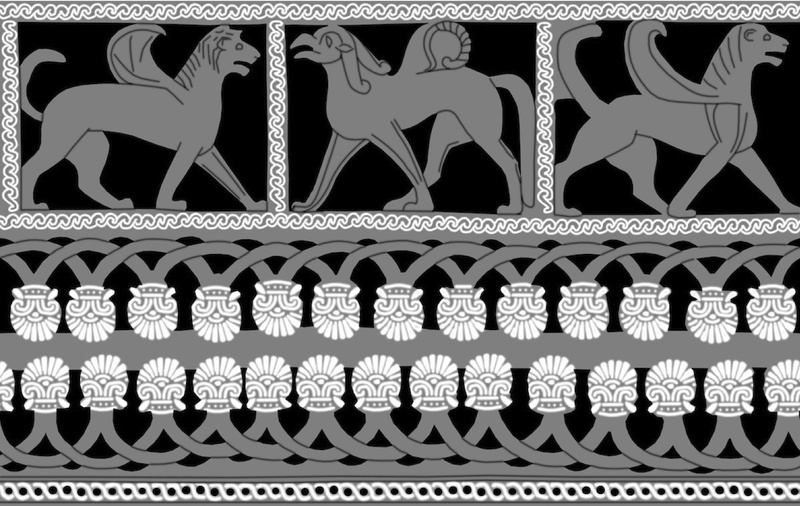 Other depictions of griffins on objects from the Regolini-Galassi tomb, such as the holmos, are very similar and show the same characteristic features. 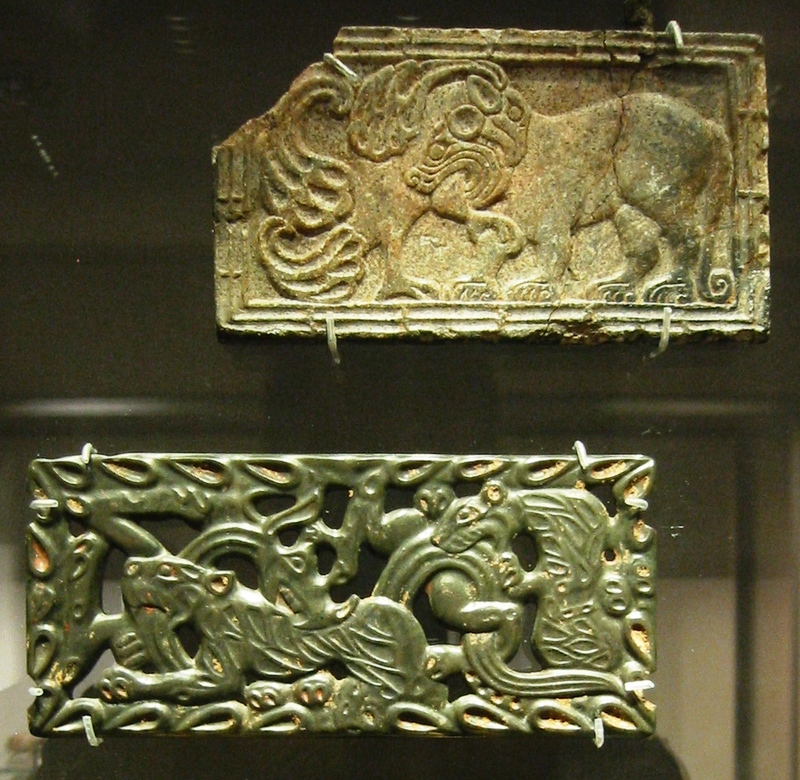 On some objects, the griffins are used more as a decorative element, still with the same characteristics (beak, curls). In 2000, Adrienne Mayor, a historian at Stanford University, published the ground-breaking book The First Fossile Hunters, which makes the link between fossils of extinct animals (such as dinosaurs) and mythical animals (such as the griffin). More specifically, she states that Scythian nomads, who were mining gold in the Central Asian area in the first millennium BC, told stories about the griffin, a fierce, eagle beaked, lion sized animal that wondered around in their mines, guarding the gold. She states that these Scythian miners must have found skeletons of the Protoceratops dinosaur (see book cover above) and that these descriptions were known to Greek traders shortly before 675 BC (the Regolini-Galassi tomb was build around 675-650 BC). In the foreword of the second edition (2010) of this book, she also notes that other similar dinosaurs have been excavated in the Central Asian region such as the Turanoceratops (published in 2009) and the Sinoceratops (published in 2010). When comparing the reconstructions of these animals (see below) with the Scythian, Greek and Etruscan depictions of griffins, we come to very interesting conclusions. The Protoceratops had a distinct neck shield and birdlike beak. The animal however was eating plants and had the size of a sheep. Some skeletons show a crest bone. The Turanoceratops was similar but somewhat bigger. In addition to the neck shield, it had two distinct horns and was the size of a lion. The Sinoceratops on the other hand had only one horn and an elaborated neck shield from which curved hornlets protruded. On both sides of the neck shield, it had extra horns. It was the size of a small elephant. Most of these dinosaur remains have been found in the western part of the Gobi desert and the Altai mountains, not far from the Silk road. This is also the area where the Scythians had their gold mines. So it is not surprising at all that in Chinese art also griffins appear. The top depiction in the image below fits very well with the Ceratops neck shield with two holes. 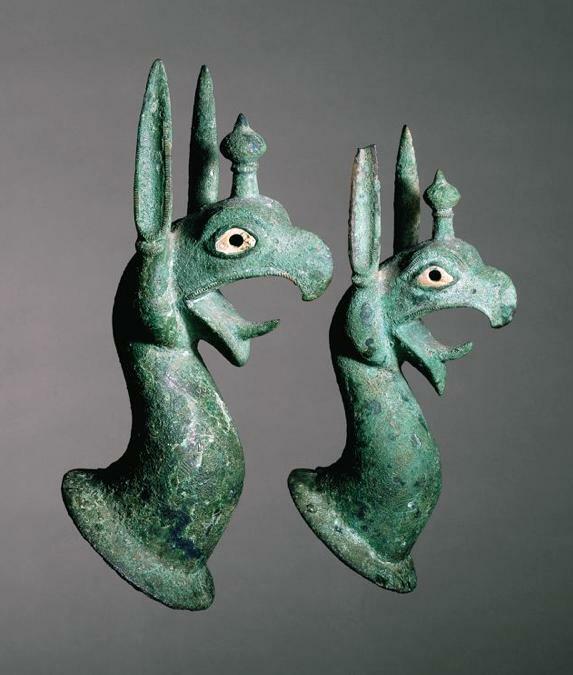 When we look at Scythian depictions of griffins (see below), we see that the animal has a crest and strange ear-like features at the back of the head that could refer to the neck shield and crest bone of the Protoceratops dinosaur. 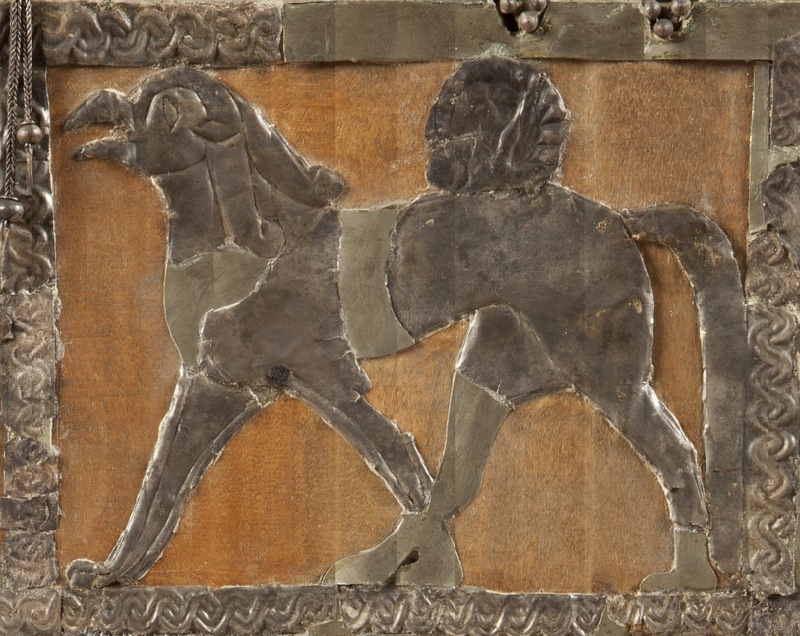 Other Scythian depictions of griffins (below) show also the neck shield (even with the holes) and the crest bone, and seem to suggest even the curved hornlets of the Sinoceratops. 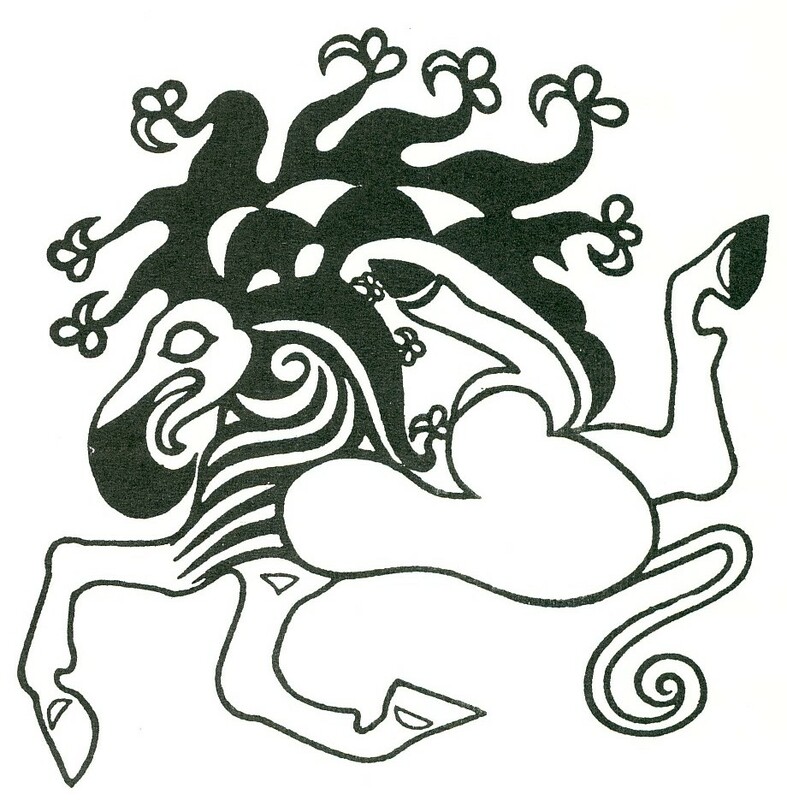 Some Scythian depictions of griffins even seem to refer clearly to the two-horned Turanoceratops. It is unclear however if the typical ears of the griffin relate to a misinterpretation of the neck shield of the Protoceratops or to the two horns of the Turanoceratops, or if both depictions have been confused and merged into one. Some Greek drawings clearly show (see below) two horns like a Turanoceratops, but also show the crest bone which is more typical for the Protoceratops. 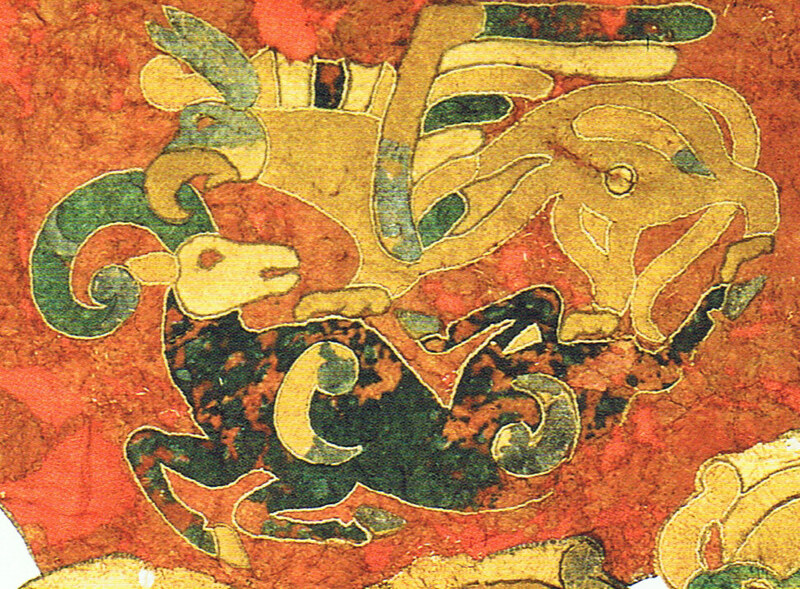 Other depictions show clearly the two horns without crest (see below). 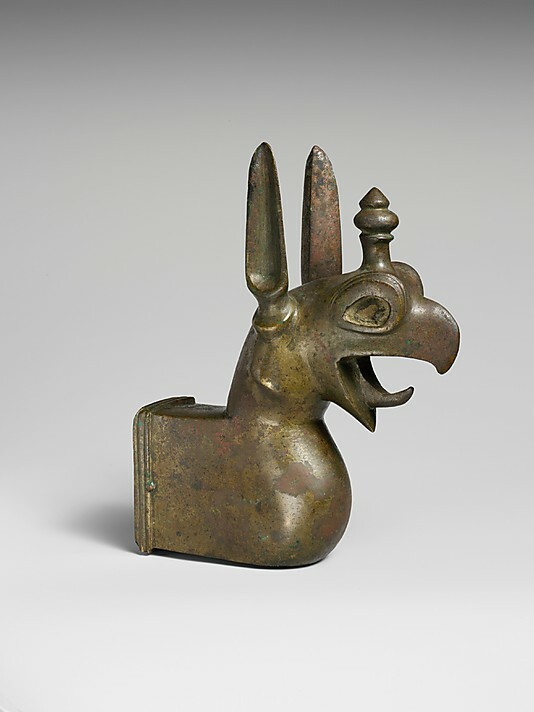 Greek and Etruscan objects of the 7th-6th century BC show griffins with strange ears connected to a bony neck feature plus a horn on top of the head. If we assume that the “ears” are an interpretation of the neck shield (because they continue in this strange feature in the neck), this depiction is very consistent with the skeleton of a Sinoceratops. 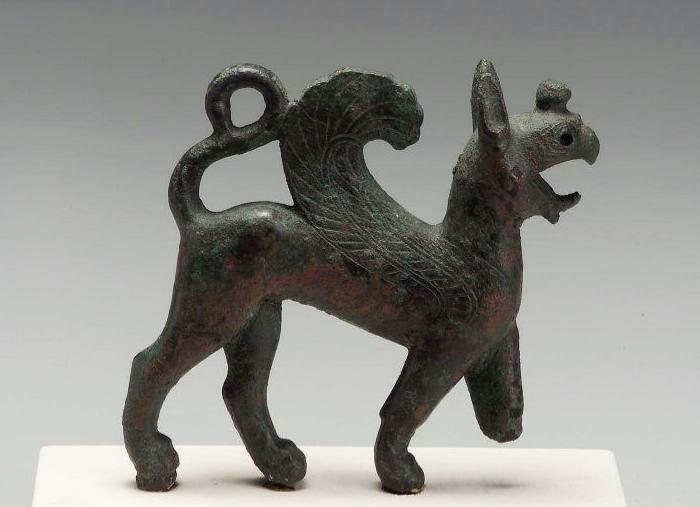 Detailed information on the appearance of such griffins were probably transferred to the Etruscans through contacts with their gold digging colleagues from Scythia, resulting in a quite different depiction of griffins in the 7th century BC (cfr. the book of Adrienne Mayor). If we go back to the griffin depictions on the Regolini-Galassi objects (images at the beginning), we see that the most prominent features that relate to the ceratops skeletons are the ears and the neck shield ending in curls. When looking at recent excavations of Sinoceratops remains, we see that such features stand out remarkably when found. 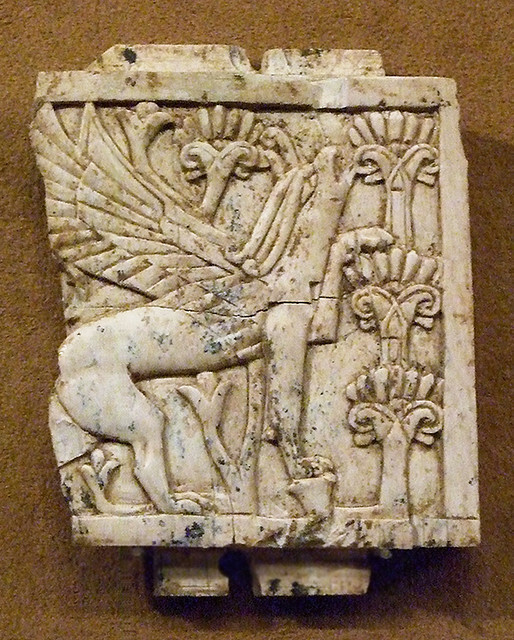 But griffins have been depicted already before 700 BC. 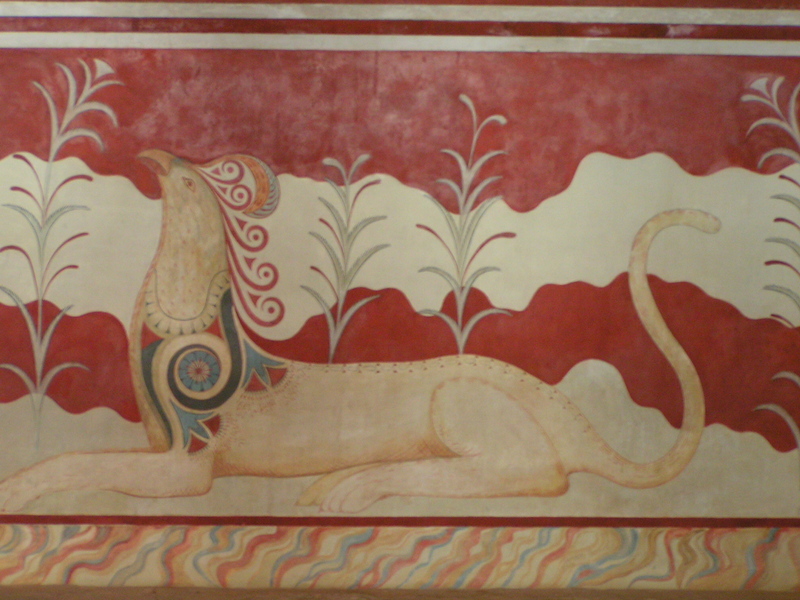 These depictions can be found not only in the Middle East but also in the Minoan palace of Crete. They typically show a griffin as a crested eagle-lion. 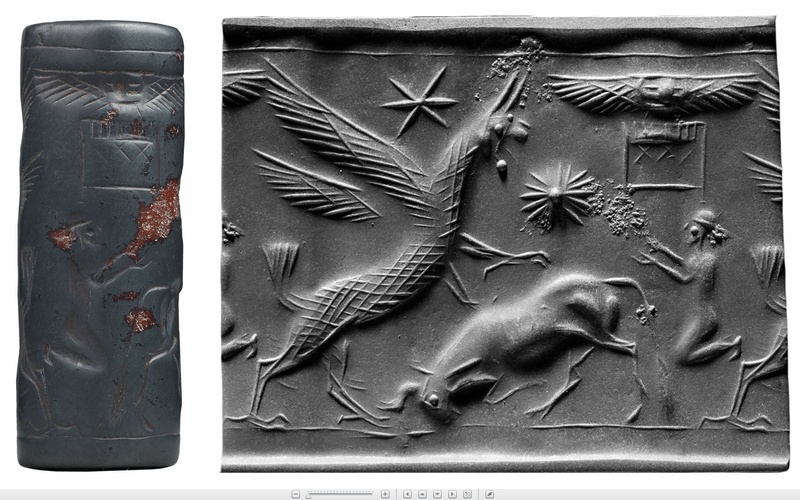 We also see that the griffin images on the objects of the Regolini-Galassi tomb are still closely related to these older depictions from the Levant, and not to the different Greek depictions (see above) that appear at the same time. One small note concerning the six-headed lebes from the Regolini-Galassi tomb needs to be made here. 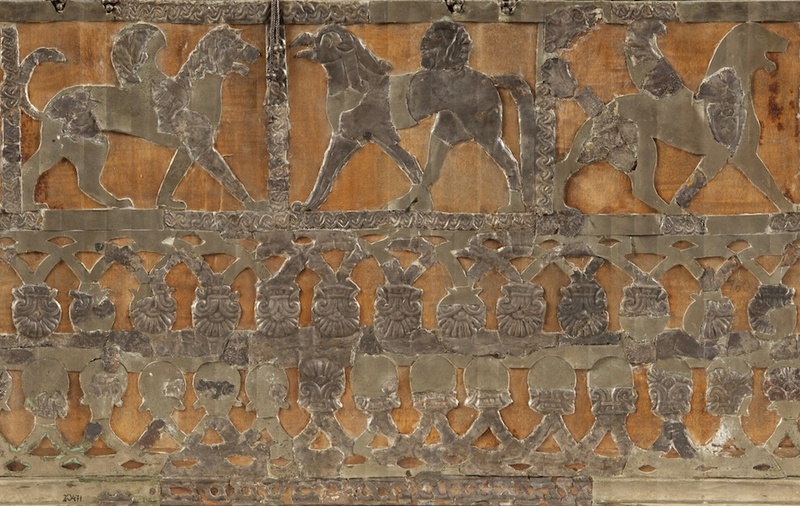 Although nearly every text about this object describes the depicted animals as griffins, close examination shows that the animals do not have any griffin features, but look much more like lions. 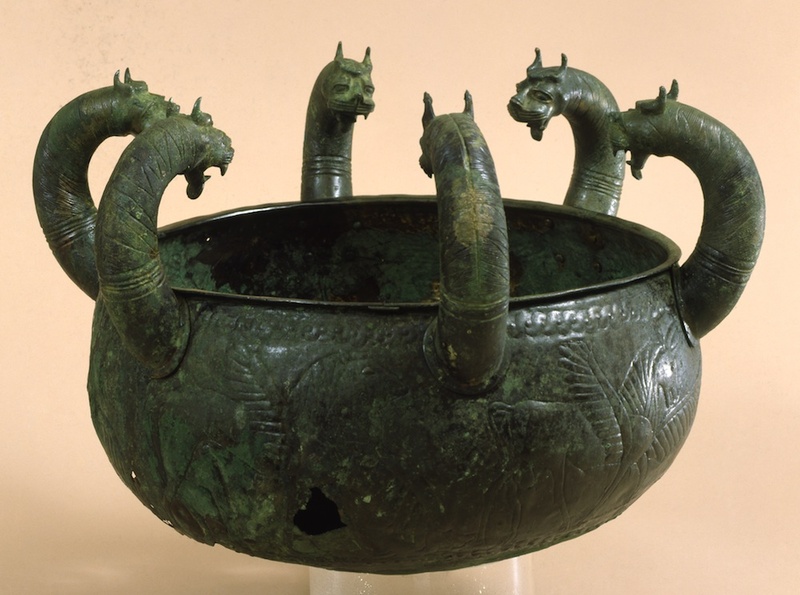 If we compare with the other five-headed lebes that is decorated by lion heads, we clearly see the analogy between features of both depictions, such as the whiskers and the teeth (griffins are never depicted with whiskers or teeth). So the heads of the 6-headed lebes of the Regolini-Galassi tomb do represent lions, no griffins! 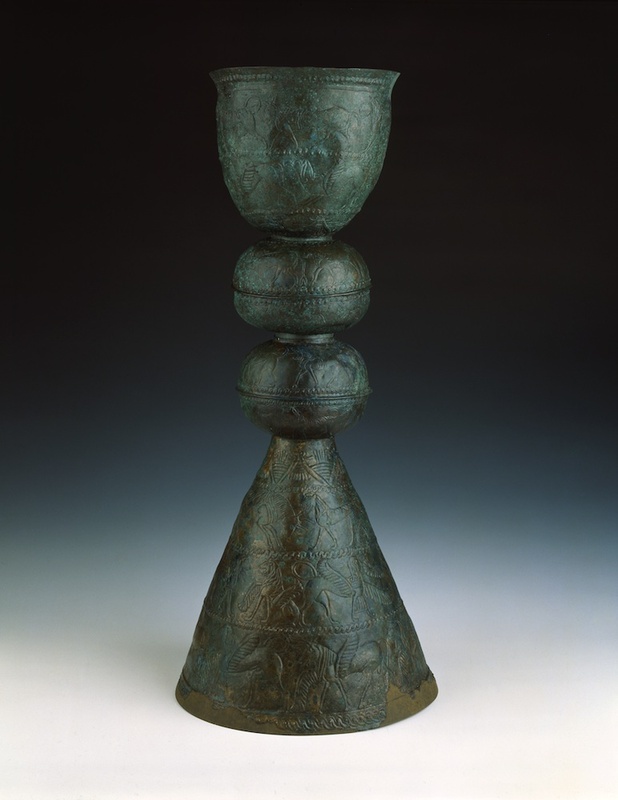 The bronze holmos of the Regolini-Galassi tomb is a very elaborated and beautiful object that has suffered significant damage and corrosion. To reveal the beauty of this object, we have unwrapped its decoration and used this image to create the line drawing of the engraved decoration. Based upon this engraving and upon detailed study of the applied embossing, we have created a displacement map of the decoration of each of the parts of the holmos. The displacement map is created in the same way as for the other objects: we simulate the engraving and embossing process in different layers of a Photoshop image, that is overlaid on the unwrapped texture. 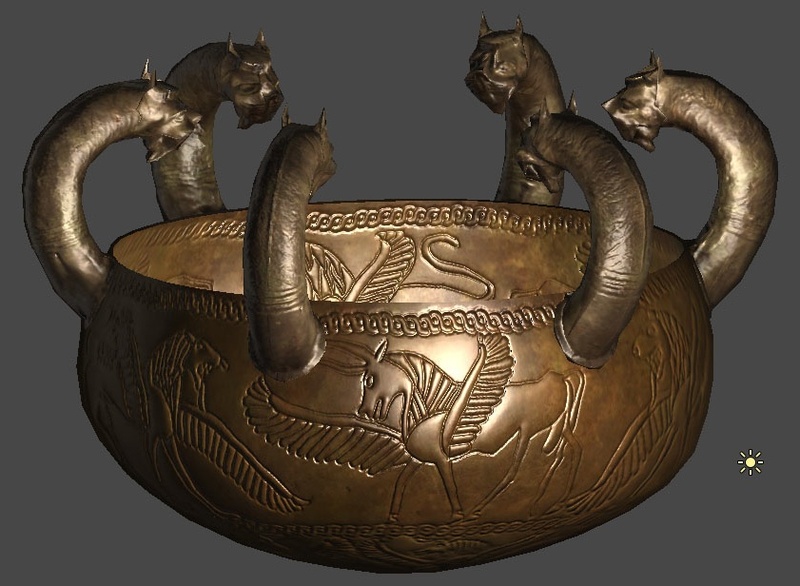 The displacement map is transformed into a normal map in Unity3D, giving a very nice real time rendering of the bronze object. The 6-headed lebes also suffered deformation and damage, so we performed digital restoration on this object as well. In this case, we derived the unwrapped texture from a 3D model that was made from dense stereo matching on a set of photographs taken with an object tent. We first identified the full engraving of the lebes on the unwrapped texture, completing the missing parts. Then, we painted the embossed features in a similar way as the other objects, through observation of those features on the many photographs taken. 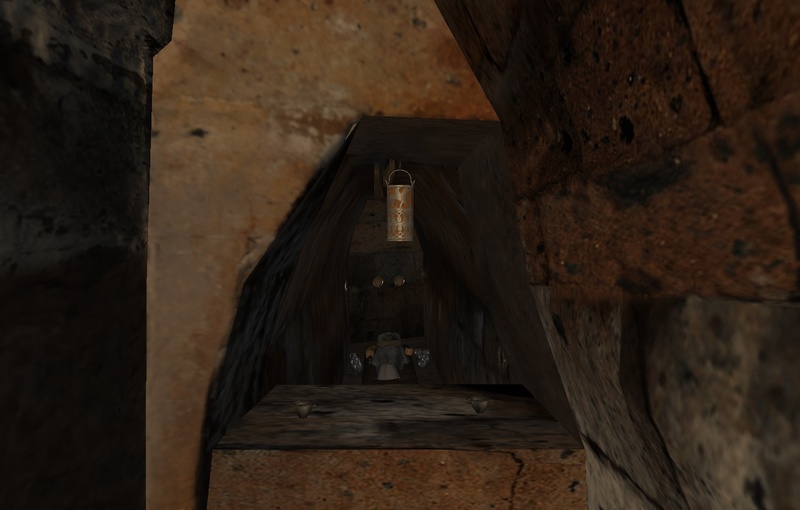 The displacement map was imported in Unity3D and translated into a normal map for real time visualisation (see images below, compare with images above). 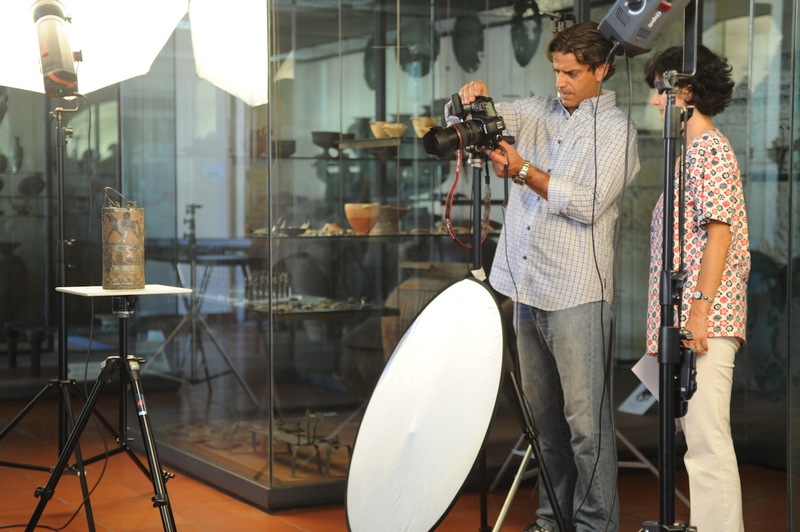 All digitally restored objects are integrated in the new version of the application. 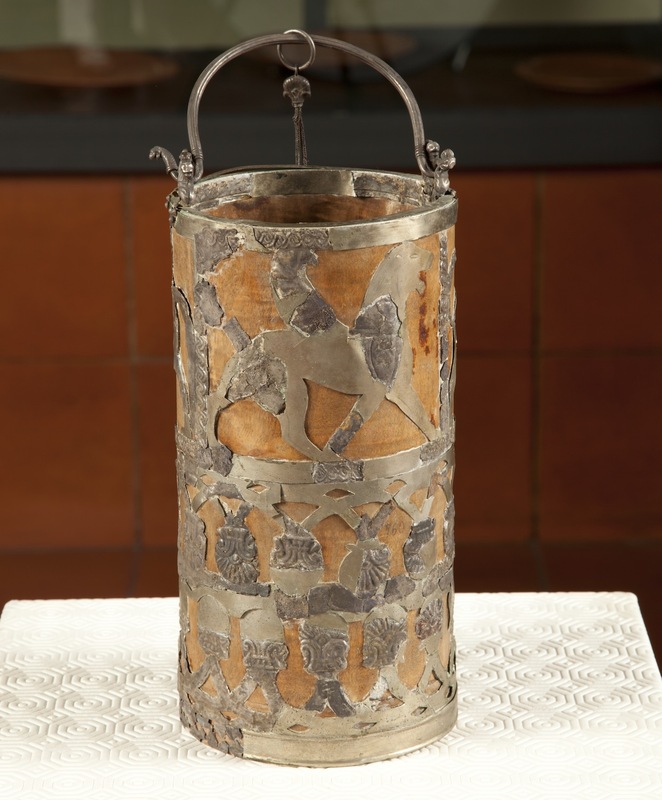 One of the outstanding silver objects from the Regolini-Galassi tomb is a situla, a ritual bucket to contain holy water or milk. The situla is only preserved partially and consisted of a wooden cilindrical bucket decorated with a silver cover showing three animals and palmettes, as the symbol of life. 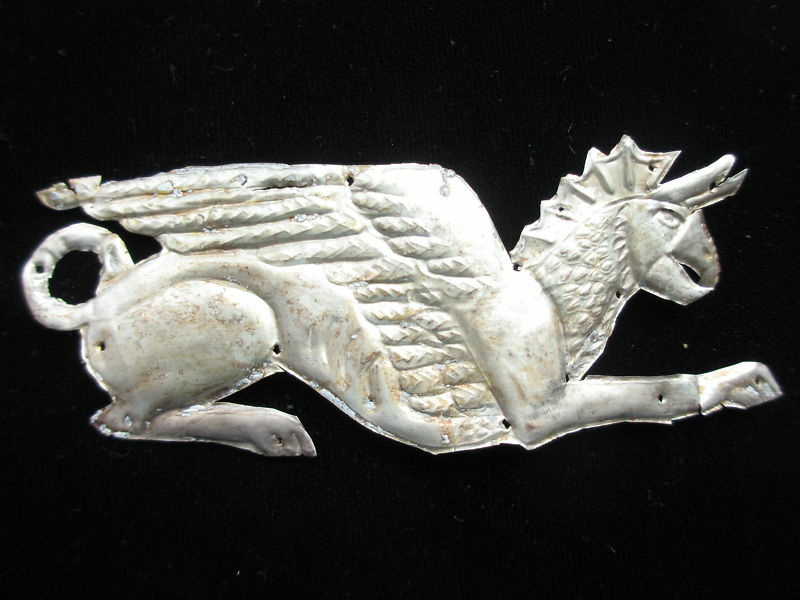 The silver decoration was found by the excavators in a fragmented state and recovered only partially. 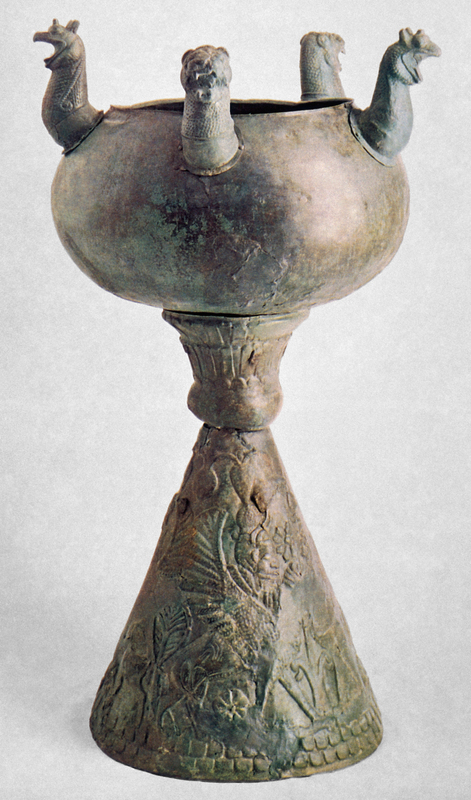 Presumably, the situla was suspended in the triangular window opening (see image below) and when the situla fell down, it broke and many fragments that fell on the ground were destroyed by corrosion. 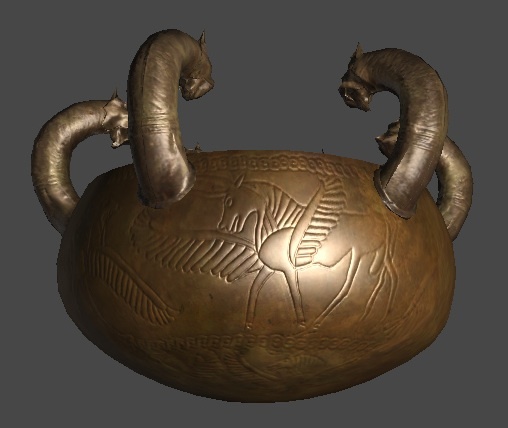 We digitised the situla by turntable photography (so that the cylinder could be unwrapped as one image) and closeup photography, so that the hinge and the chain could be modelled in 3D by hand. The main goal of unwrapping the cylindrical silver sheet was to digitally restore it. The physical restoration has not been documented and dates back probably to the 19th century. The resulting photographs were assembled into one image, depicting the cylindrical surface of the situla. As can be seen from the images below, the silver sheet has also been embossed and engraved. The digital restoration focused on understanding the production process and improving the physical restoration, based upon that knowledge, as the parts that have been added do no contain any engraving or embossing. 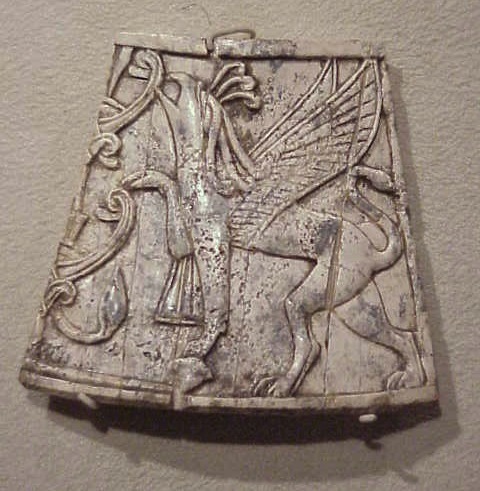 It appeared also that a few small parts of the original silver are missing (see for example the wing of the griffin below). 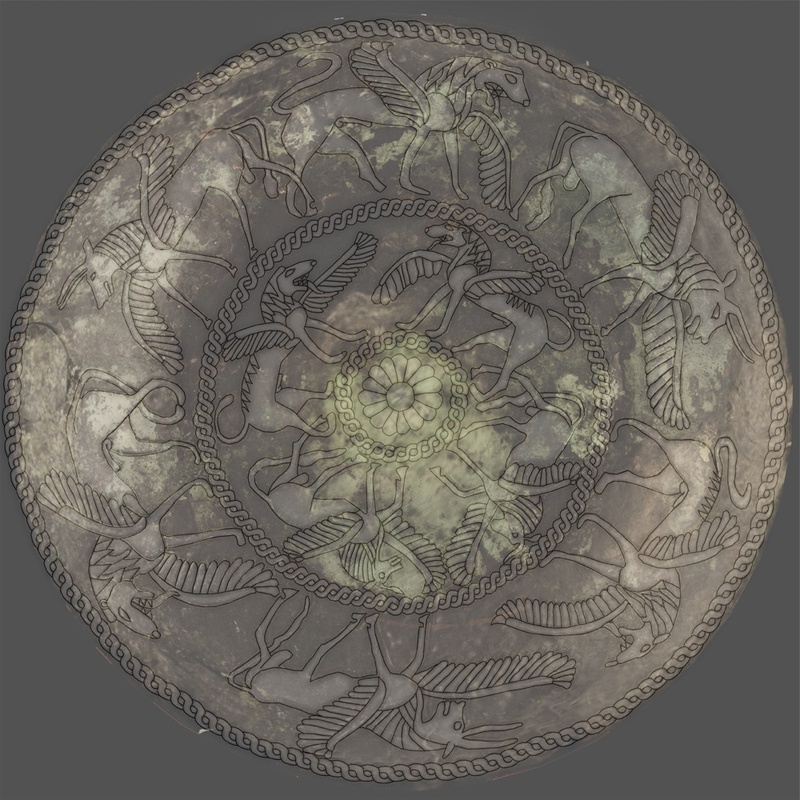 The digital restoration was implemented through the creation of a displacement map, which is the most efficient technique to deal with embossed and engraved objects (see also our blog post on the digital restoration of a patera). In Photoshop, we created extra layers on top of the unwrapped situla decoration image, one layer for the engraving, one layer for the embossing. Additional layers have been introduced to simulate the deformation of the metal when engraving. We also created a transparency map to indicate the form of the cutouts in the silver sheet. Study of the unwrapped image showed that the palmettes were made by hammering the shape with a tool in the form of the palmette. This production process was simulated in Photoshop. The resulting transparency and displacement maps are used in the interactive real time visualisation system that has been implemented by CNR-ITABC (see image below).